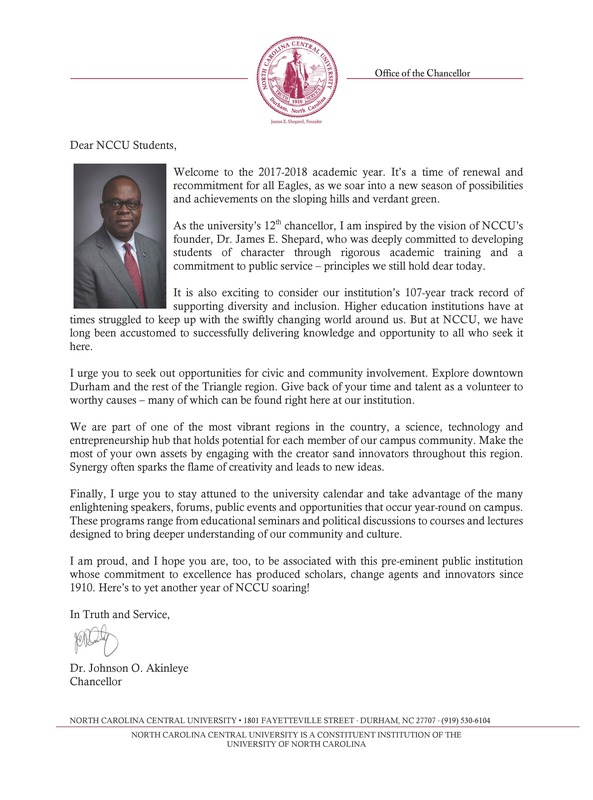 North Carolina Central University is committed to quality educational opportunity and does not discriminate against applicants, students, or employees based on race, color, national origin, religion, age, or disability. Moreover, North Carolina Central University is open to all races and actively seeks to promote racial integration by recruiting and enrolling a larger number of white students. This commitment is in keeping with Title IX of the Educational Amendments of 1972 and Section 504, Rehabilitation Act of 1973. The Bulletin of North Carolina Central University (USPS 074-800) is issued every two years by North Carolina Central University, Durham, NC 27701-1912. Periodical Postage Paid at Durham, NC 27701. Postmaster should send address change to the Bulletin of NCCU, Office of Admissions, McDougald House, Lawson Street, Durham, NC 27701-1912. All catalogs © 2019 North Carolina Central University. Powered by the Acalog™ Academic Catalog Management System™ (ACMS™).